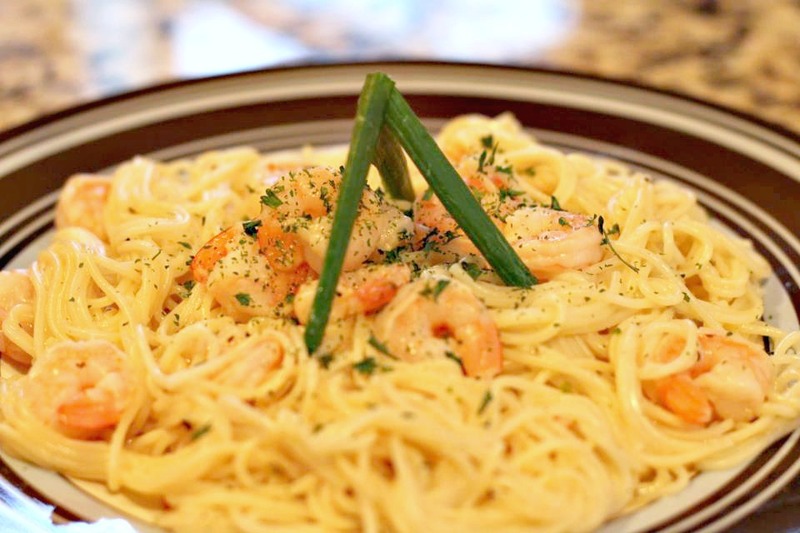 So the title of this post is “Easy Shrimp Scampi,” but really it could be titled “So Easy It Will Blow Your Mind And Your Taste Buds Shrimp Scampi. ” But that just seemed excessive. I had never used Lawry’s marinade before, but dang that junk is good! I feel like there are SO MANY marinades to choose from. I mean seriously the marinades take up like half of an entire aisle at Wal-Mart, and the flavors range from your basic “Beef” or “Chicken” all the way to “The Shizzle Voodoo Hot Jerk Marinade.” Umm what? So many options kind of scare me. I want to try new flavors, but I also don’t want to waste my money on something gross. I need other people (and recipes) to tell me what marinades they’ve tried and enjoyed to help focus my marinade choices. If you have a suggestion of a really great marinade (bottled or homemade), let me know in the comments! Anyways, this recipe called for Lawry’s Herb & Garlic marinade, and it was a home run. I’ve never tried it on any other meat, but it was delicious in this shrimp scampi! Ok, now for the “Easy” part of the shrimp scampi. It’s basically this simple: Marinate shrimp, cook pasta, cook shrimp, mix in additional marinade, and BOOM – Dinner is served. Doesn’t get much easier than that for a dish that tastes great! In a large Ziploc bag, place 1 cup of marinade & shrimp. Marinate in refrigerator for 30 min. Remove shrimp from marinade, discard marinade. Heat olive oil in a skillet over med heat. Add shrimp, cook for 4 min, stir often until shrimp turn pink and are done. Stir in remaining 1/2 cup of marinade until heated through. Serve over pasta. Sprinkle with basil. I like to marinate chicken in bottled creamy Italian salad dressing overnight or for at least an hour. I have been known to have my chicken cleaned and in a ziploc bag to be frozen and I will add the italian dressing to the bag prior to freezing to marinate as it thaws. I do that occasionally too! It definitely adds a lot of flavor! We use Stubbs marinades and package our own meat to freeze. It’s amazing! We’ve used Stubbs many times on all kinds of meat! It’s so good! Definitely one you can’t go wrong with.